A choir from one of the most prestigious schools in England is to perform a concert to raise funds for a church dedicated to the life of the Personal Ordinariate of Our Lady of Walsingham. 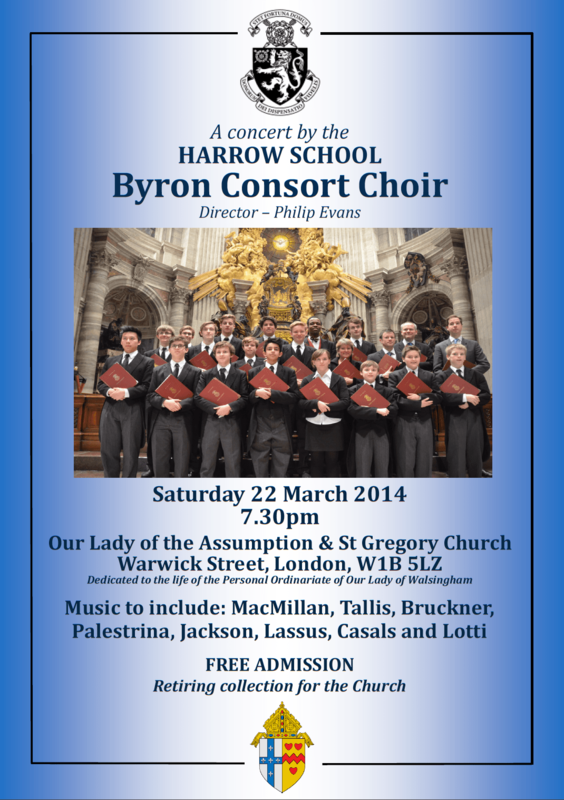 The Byron Consort is the elite vocal ensemble of Harrow School and will perform a special concert of music by composers including MacMillan, Tallis, Bruckner and Palestrina at the Church of Our Lady of the Assumption and St Gregory, Warwick Street (London, W1), on Saturday 22 March. The concert will be a free event followed by a retiring collection for the work of the church. Philip Evans, currently a House Master at Harrow, founded The Byron Consort in 2001 and continues to be its Director. The choir consists of about sixteen boys from the school – many of whom are ex-choristers from leading cathedral and collegiate choirs – and four adults. It sings a mixture of unaccompanied sacred and secular music, most of which comes from the Renaissance, Romantic and Modern periods. Since its inception The Byron Concert has sung regularly at services and concerts at Harrow and has performed at St Paul’s, Westminster, Winchester, Canterbury and Chichester Cathedrals, Westminster Abbey, St George’s Chapel Windsor Castle, as well as various college Chapels in Oxford and Cambridge. A few years ago, the choir sang for the British Prime Minister David Cameron and guests at a Christmas dinner in Blenheim Palace. The choir has also made thirteen overseas trips, including three visits to Rome and two to Venice, as well tours of Vienna, Salzburg, Stockholm, the United States and Russia. Soon after performing at the Church of Our Lady of the Assumption and St Gregory, the choir will be visiting Toronto and Chicago, where they will sing at St Mark’s Church in Niagara on the Lake and the churches of St John Cantius and St Peter’s in The Loop, among other venues. The Church of Our Lady of the Assumption and St Gregory was dedicated to the life of the Personal Ordinariate of Our Lady of Walsingham in January 2013 by the Most Revd Vincent Nichols, Archbishop of Westminster. It is the home of the Ordinary of the Personal Ordinariate, Mgr Keith Newton. The Personal Ordinariate of Our Lady of Walsingham was established in 2011 by Pope Benedict XVI as a special structure within the Catholic Church to allow Anglicans to enter into full communion with the Pope, while preserving elements of their distinctive Anglican liturgical and pastoral traditions. The Byron Consort concert at the Church of Our Lady of the Assumption and St Gregory will take place at 7.30pm on Saturday 22 March. Entry is FREE though donations may be made when a retiring collection is taken.